Intel’s next-generation “Ivy Bridge” chips will include a host of improvements, including integrated graphics that the company claims will narrow the lead now held by AMD’s Fusion APUs. 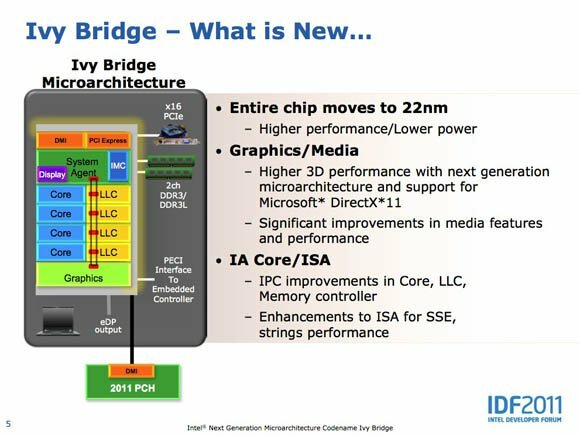 Improved graphics performance is not the only architectural improvement in Ivy Bridge over Intel’s current “Sandy Bridge” chips. 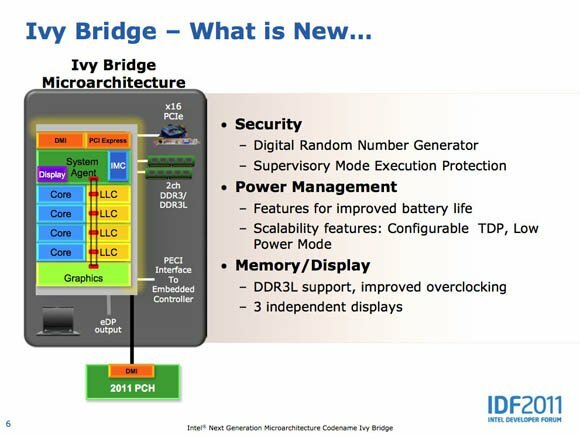 Also new, said Ivy Bridge interconnect and integration engineer Varghese George at the same session, are support for low-power DDR3L memory, dynamic (no reboot) overclocking control of both the compute and graphics cores, power-management improvements, security enhancements to guard against escalation of privilege attacks, and more. Such a significant redesign is unusual in Intel’s “tick-tock” chip-release cadence, in which a tick in a process shrink – say, from 32nm to 22nm – and a tock is a new architecture. During his IDF keynote on Wednesday, Intel’s PC client honcho Mooly Eden referred to Ivy Bridge as “a tick-plus” – a scaled-down version of Sandy Bridge, but with its own architectural improvements. Eden focused on one of those improvements, a power-saving enhancement called power-aware interupt routing, or PAIR, which intelligently sends interrupts to cores that are already up and running, rather than to those that have been powered down and are comfortably asleep. Accessories and external devices continually send interrupts to a CPU to check on what’s what. USB, for example sends around three thousand interrupts per second – and if a core is asleep, it must wake up to handle that interrupt before it can go back to sleep. Without PAIR, Mooley said, each of USB’s 3,000 interrupts per second are sent to core 0 – and if core 0 is asleep, USB wakes it up, which wastes power. Simply put, PAIR routes interrupts to a core that’s already awake, thus saving power. A small amount, to be sure, but in the world of power management, many small amounts can add up to significant power savings. But it’s the improvements to Ivy Bridge’s graphics improvement that both Mooley and Piazza cited as the main reason that Ivy Bridge should be considered a “tick-plus”. 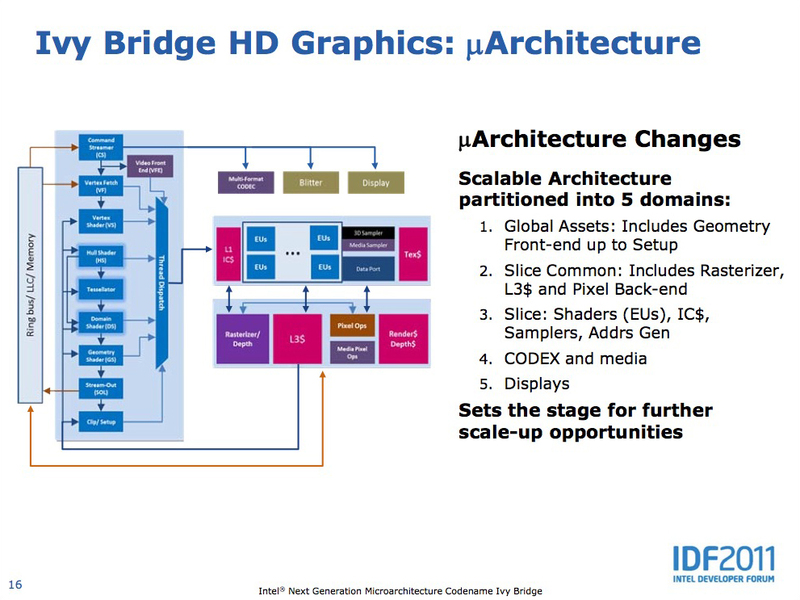 Ivy Bridge’s integrated graphics, Piazza said, “is not a tick, it’s a tock,” citing such improvements as support for DirectX 11 – in AMD’s APUs, but new for Intel – plus improved media performance and the ability to drive three displays from one Ivy Bridge chip, or two when a laptop is docked with its lid closed. 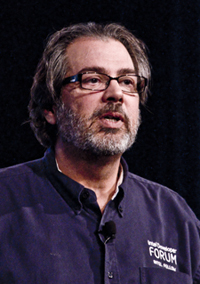 In addition to enabling Cerberus to better enjoy his Ivy Bridge Ultrabook™, the new graphics architecture, Piazza said, is able to “fix some things that were less efficient on Sandy Bridge, and create a system that’s much more scalable, much more optimal” when used in different chips in the Ivy Bridge series. The Ivy Bridge design team reordered the graphics pipeline, partially to make it more scalable through the addition of more or fewer graphics processing units, and partially to simply make it faster and more efficient. In the new, rearranged Ivy Bridge graphics architecture, however, the L3 is closer to the units that it needs to feed, and it conserves power “because you don’t have to go out and light up the whole [cache communications] ring,’ which would eat put more power and eat up bandwidth.” The addition of the L3 in Ivy Bridge “just floats all boats,” Piazza said. Piazza also ran down a laundry list of architectural changes and improvements in Ivy Bridge, including shared local memory. “You take a look at what we did here – the amount of scatter-gathers per clock – is 32 times more than Sandy Bridge. If you’re running GPGPU workloads … don’t be surprised if performance is extremely higher,” he said, citing 20X improvements they’ve seen in some workloads.